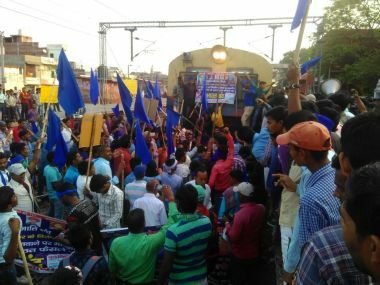 A number of Dalit groups called for the bandh Monday to protest against the recent Supreme Court judgment on SC / ST preventive act 1989.On Monday morning, a protest was called by the Dalit community of the 'Samvidhan Bachao Sangharsh Committee'.There have been many violent incidents in northern India.In some places, the protesters blocked vehicles and trains.Shops were also forced to close.Violent events took place in protestors in some areas. In Madhya Pradesh, four people were killed and many injured. The band has become violent in Gwalior-Chambal, Bhind, Balghat and Satna districts. Rahul Pathak lost his life after an unidentified assailant who was involved in the agitation in Morena district.The curfew was imposed on all police stations in Morven district as the situation was settled. Hundreds of passengers were stranded when the protesters blocked trains at all railway stations in Mumbai and Delhi. Chhattisgarh Express stopped the train and attacked the engine driver with stones. Police are making cosmic efforts to protect the driver from them. A journalist Giriraj Rajariya said that a police and journalist was injured when protesters stormed the National and State Highways in Morren area. On the other hand, the petrol pump was burnt on the cars in Meerut in UP. Attacks have been made by keeping shops in Agra. The police had to lathi and scold the situation after the situation. The protest of protesters in Punjab, Bihar, and Odisha has become tense. The tires on the roads were burned and the crowd rushed out of the crowd. The police were stuck in the distance ... kilometers of vehicles were stuck. Passengers are also struggling to stop trains. Private vehicles are also stuck.